SHER Consult Ltd. is a Rwandan consulting engineering company founded in 2010. It is for 100% owned by SHER Ingénieurs-Conseils s.a., a Belgium based company with agencies around the world (Africa, America, Asia and Europe) which started its activities in 1985 in the sub region, Burundi and Rwanda. 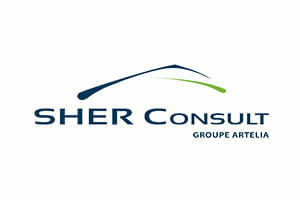 SHER Consult Ltd. Is part of the SHER Group and has a permanent office and team in Kigali. SHER Group has a thorough knowledge of the Great Lakes Region. SHER Group has a track record of over 800 references. It represents 30 permanent Engineers and Graduates and 10 Technicians, Topographers, Designers and Operators. SHER Group has its own network of more than 6.000 highly specialised consultants who are permanently on hand to seek solutions for the company projects or activities. SHER Consult Ltd offers multidisciplinary consulting activities in the sectors of water (drinking water, purification of waste- and rain water, hydro-agricultural and hydro-electric facilities), construction and rural infrastructure, agro-silvo-pastoral and agro-industrial projects, land development, environmental protection, rural development, renewable energy, trails and transportation, geographic information systems. The permanent staff includes engineers and university staff, as well as technicians. SHER Consult Ltd. also has a vast network of consultants and experts in various specialist areas. SHER Consult Ltd is able to perform all phases of a project. From master planning and identification studies, detailed design studies and supervision to the operation of infrastructures, the company has the resources and qualified personnel for “Turn-key” market solutions. Our permanent team based in Kigali comprises numerous technical experts and consultants in areas such as hydraulics and engineering. The team is composed of Rwandan and international experts. The permanent staff includes 5 engineers and graduates and 10 technicians. In addition, SHER Consult can count on a broad network of freelance consultants in highly specialized fields. The success and international outreach of SHER mean we are constantly looking for new staff to get involved in projects. SHER is constantly on the lookout for highly qualified and experienced individuals with varied technical and operational skills. Interested in cooperating with SHER ? Send us your CV using the form below, under the "contact" section. Please fill in the requested fields in the form so we can help you in the best possible ways. We will get back to you within 24 hours.